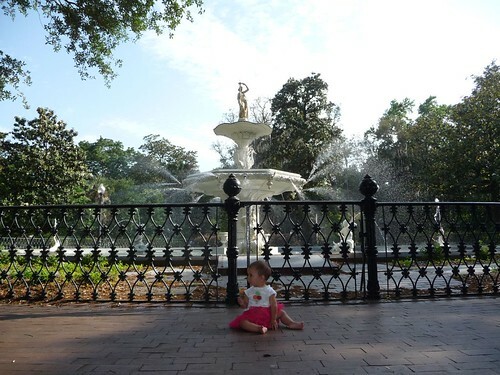 Mali Mish – Day 79: First day in Savannah, Georgia. Day 79: First day in Savannah, Georgia. Our first morning in Skidaway Island State Park we woke up in the campground set in the Georigian forest that is teeming with wildlife. None was more excited than Yoda who stared at them all morning long through the wraparound windows behind the dinette wishing she could prowl like a real cat should. Sorry Yoda, real cats don’t take road trips either. It was a warm day here in Georgia but with the huge trees providing a vast forest canopy at the state park, it was very nice and comfortable. That’s is not really going to help us much though since we plan on heading into Savannah and start exploring what it all has to offer. And it was HOT. Driving into Savannah we didn’t really know what to expect. Since we planned on spending several days here, today was just going to be a general scoping out of the city so we went to the visitors center. 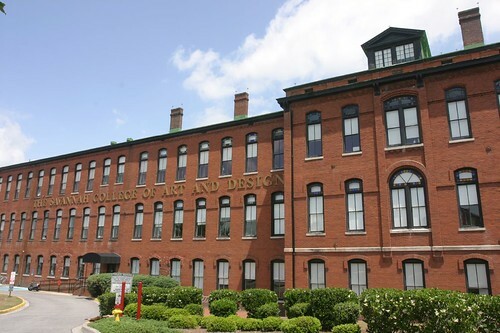 One of the things you notice immediately in Savannah, aside from the colonial era architecture, is the presence of S.C.A.D.. That stands for Savannah College of Arts and Design. They are everywhere in the downtown area. Since its founding relatively recently in 1978, the school has grown from a single building with only 80 students to multiple buildings all across downtown and nearly 10,000 students. Here is one of the buildings right next to the visitors center. The popularity of the school means that they have taken over a lot of old structures and restored them for their use while paying a lot of respect to the historical significance along the way. 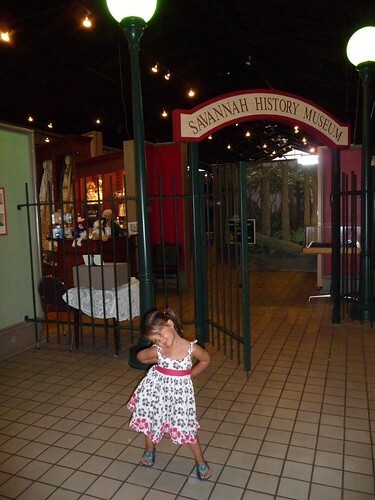 We parked at the visitors center to get an idea of how to plan our visit here at Savannah and the girls started with a visit to the historical museum. Sure there are civil war battles and European settlers in the history of Savannah but what can be more interesting than the Forrest Gump bench? 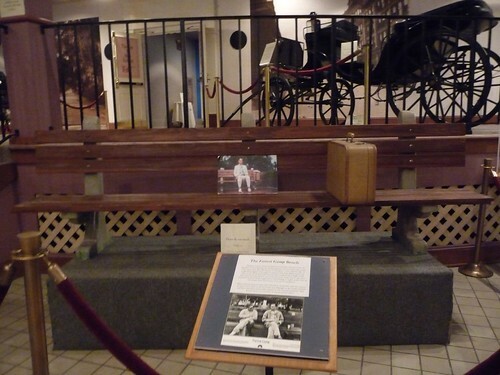 Actually, this is a replica of the bench that was use in the movie which is a replica of the actual benches all around town. So I guess you can call it a replicated replica. 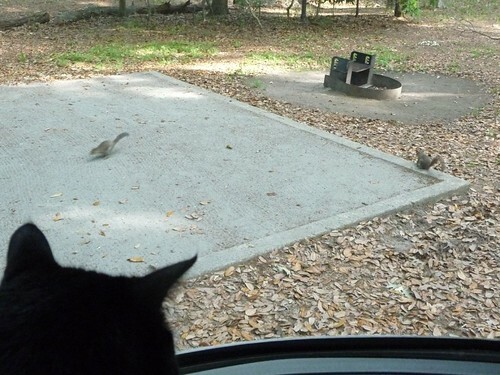 We asked the staff at the visitors center where is a good place to grab a bite to eat around here. They gave us a few options. 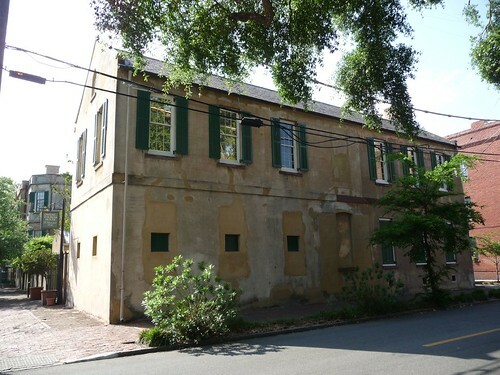 First of which was a place called Mrs. Wilkes Boarding House. They gave us general directions but ultimately they told us to just look for where everyone is lining up outside. And a line there was. I guess it is like this everyday. Even though today is a Monday, people are here to eat. Not just tourists either as there are lots of regulars that come here for their famous southern cuisine. Being so far back at the line that doesn’t seem to be moving on this hot day, we decided to try our luck another day. Not really knowing where we are going, we walked blocks and blocks looking for something to fill our bellies. With the heat beating down on us we were sweating profusely while looking for any place to grab a bite. The first place we found was a Wendy’s. Well, it’s not quite the southern comfort food we were looking for but at least it was air conditioned. 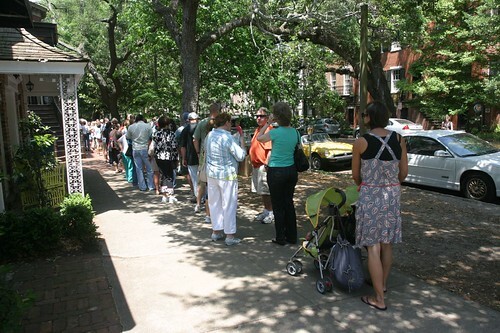 By now we had pretty much given up on the walking tour of Savannah and started to make our way back to the car. Driving around the city with the AC blasting turned out to be not a bad idea on a day like this. We found plenty of metered parking and stopped at the legendary Leopold’s ice cream parlor and got a taste of their creamy old fashion ice creams. 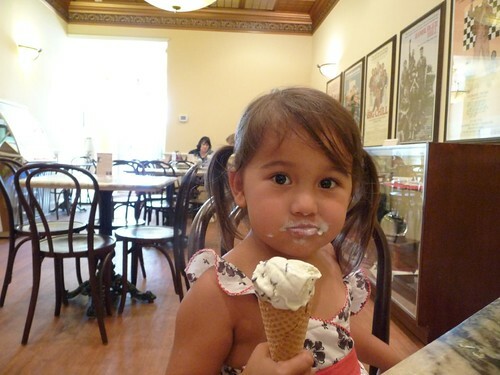 No bother asking Ava if she likes her ice cream. She loves them all. 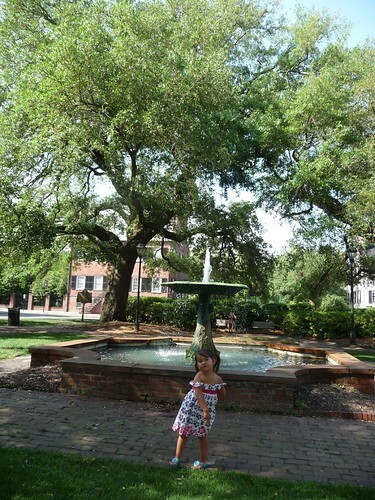 With our car parked near the neighborhood and bellies full of food, we decided once again that we would wander around some more to check out the historical buildings and the park-like squares that makes this city a national landmark. 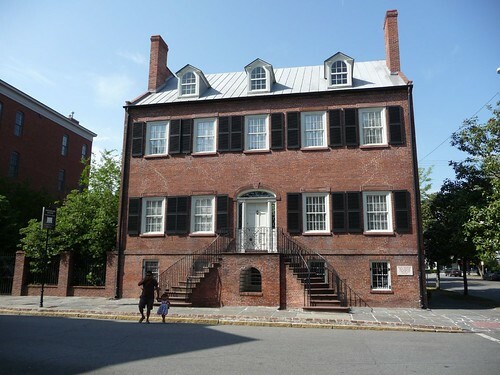 There are a total of 22 squares in the city of Savannah. Originally during the planning of the city, only 4 were built. Over the next 100 or so years, more were added to a total of 24. 3 of them were lost since due to various reasons and 1 was recently restored and plans are in place for the other 2. This is the Kehoe house. Once owned by Joe Namath and apparently very haunted. Savannah having been named the most haunted city in America, this house certainly has done its fair share in contributing to that reputation. Previously a funeral home, it is now a bed and breakfast so if anyone is interested in experiencing it for yourself just how haunted it is, tell them Mali Mish sent ya. Here is the Owen-Thomas house. Now a museum open for tours. 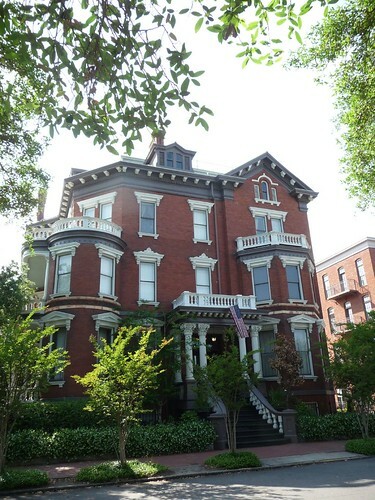 It is one of the most architecturally significant houses here in Savannah. This is just the carriage house in the rear of the main house. 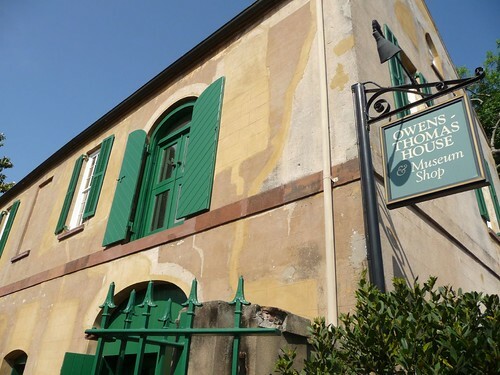 Most of the houses that offer tours will have the visitors enter from the carriage house so the front can be left undisturbed. 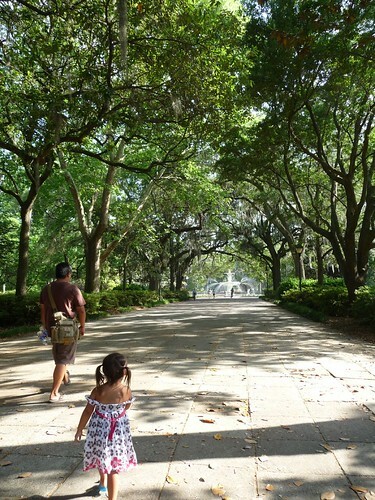 In the middle of the city is a huge park nearly 30 acres in size. 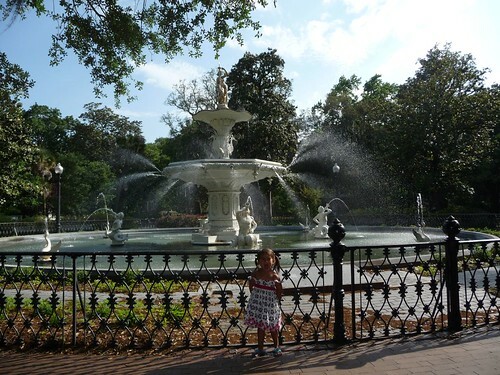 It is named Forsyth Park after the 19th century Governor of Georgia. Governor Forsyth donated 20 acres of his own land to make the construction of the park possible. The ornate fountain at the middle of the park is over 150 years old and fenced off probably to prevent the people from taking a dip in it to cool off in hot days like today. Sorry Mila, this pool is not for swimming. 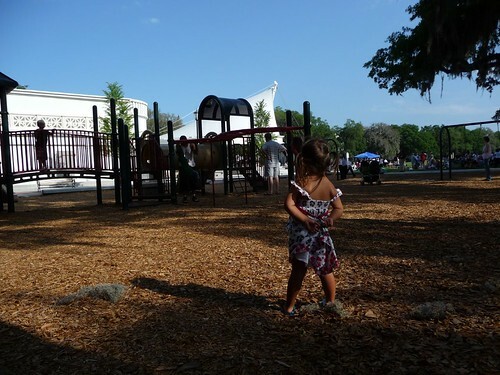 Even Ava had second thoughts about playing a the playground in this heat. We will be back again tomorrow. Hopefully this heat does not persist.